We consider the approximate minimization of a given polynomial on the s tandard simplex, obtained by taking the minimum value over all rational grid points with given denominator r∈N. 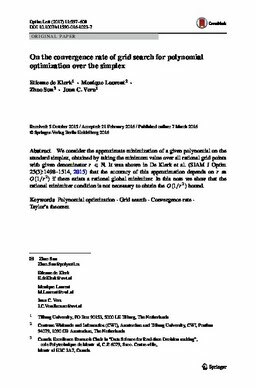 It was shown in [De Klerk, E., Laurent, M., Sun, Z.: An error analysis for polynomial optimization over the simplex based on the multivariate hypergeometric distribution. SIAM J. Optim. 25(3) 1498–1514 (2015)] that the relative accuracy of this approximation depends on r as O(1/r2) if there exists a rational global minimizer. In this note we show that th e rational minimizer condition is not necessary to obtain the O(1/r2) bound. On the convergence rate of grid search for polynomial optimization over the simplex.